An hour at Kidderminster from 2.45 to 3.45 was long enough to see both Santa Sleigh Express trains on Christmas Eve. 33108 departed for Highley with 43106 on the rear at 2.45 then at 3.15 2857 arrived with 50044 on the rear. Not long after, the 50 headed back to the depot, just as the miniature Warship passed by. Finally as I headed back for my train home, 2857 was ready to propel the stock to the carriage shed and I just had time to film that before walking to “the other” station just as my train arrived. Photos of locos below, ideal for mobile or tablet. Larger photos, including units in gallery as above. This entry was posted in Sharpo's World gallery, Sharpo's World Photo Updates, Sharpo's World video updates on December 24, 2018 by Sharpo. A sunny afternoon and a couple of trains to see. 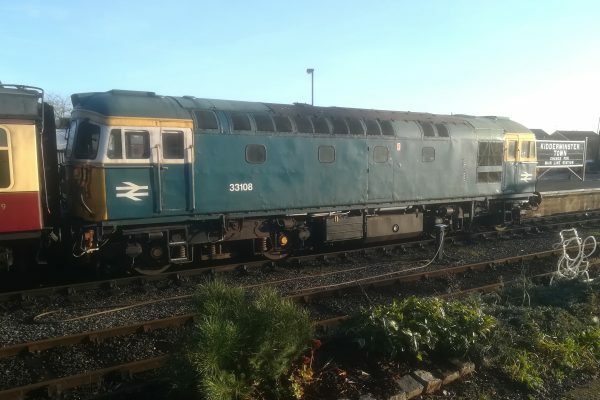 33108 in full sun. This entry was posted in Severn Valley Railway, Sharpo's World gallery, Sharpo's World Photo Updates on December 24, 2018 by Sharpo. The video was uploaded yesterday and I have just finished uploading the photos cropped from the video. As always, more units than locos – but just locos in this post. Link to photos in gallery. This entry was posted in "Mostly Midlands" gallery, Sharpo's World gallery, Sharpo's World Photo Updates on December 18, 2018 by Sharpo. Not a day to stand around, cold and damp, and of course nothing else worth seeing here, so just one photo and short video. 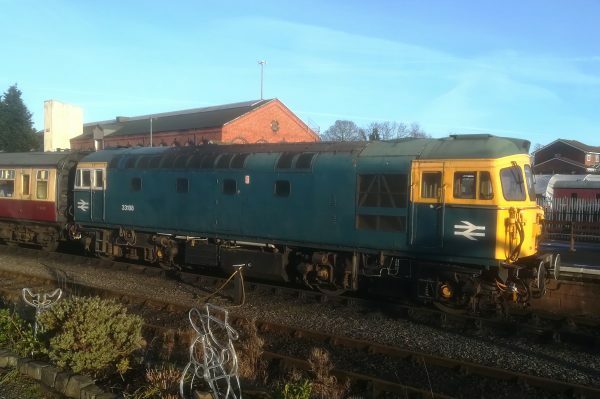 1Z46 Salisbury – Bescot – Chester. 34046 took over at Bescot. This entry was posted in "Mostly Midlands" gallery, Sharpo's World gallery, Sharpo's World Photo Updates, Sharpo's World video updates on December 15, 2018 by Sharpo. This second post has a link to the video and 6 more photos of the locos seen. At this moment in time I won’t be adding photos of all the units as there were quite a lot of them, but they can be seen in the video. This entry was posted in "Mostly Midlands" gallery, Sharpo's World gallery, Sharpo's World video updates on December 14, 2018 by Sharpo. Final video and mostly of the Panniers. After the arrival of 2857 the Panniers have their bunkers topped up with coal then shunt round to couple up for the next departure. 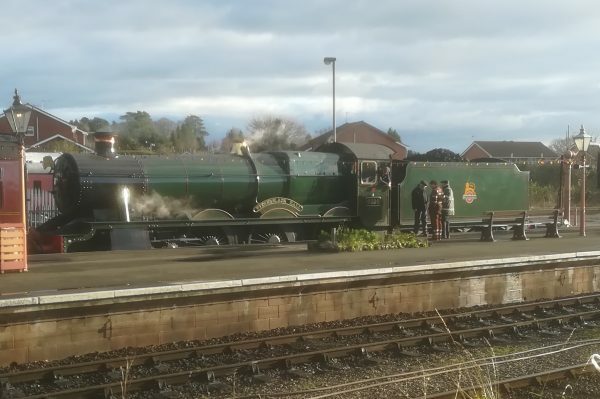 Fortunately 6990 wasn’t completely bowled but as in an earlier video I didn’t get a proper video of the Panniers departing. Link to YouTube video or photos for this date in gallery. This entry was posted in Severn Valley Railway, Sharpo's World gallery, Sharpo's World Photo Updates, Sharpo's World video updates on December 13, 2018 by Sharpo. Third video, featuring the locos as above and of course “Jean” on the Coalyard Miniature Railway. I could probably have combined the final footage into 1 video as there isn’t as much left as I thought, but this uploaded overnight – so here it is. Probably see more photos of the Panniers in the final video so just Taw Valley photos below. This entry was posted in Severn Valley Railway, Sharpo's World gallery, Sharpo's World Photo Updates on December 12, 2018 by Sharpo. Link to YouTube video or photos in gallery. This entry was posted in Severn Valley Railway, Sharpo's World gallery, Sharpo's World Photo Updates, Sharpo's World video updates on December 11, 2018 by Sharpo. This entry was posted in Severn Valley Railway, Sharpo's World gallery on December 9, 2018 by Sharpo. 31468 and 31454 near Bath in 2003, Echills Wood Railway in 2004, The Engine House under construction, and 7802 in 2006, 47828, 47810 and 43009 at Bromsgrove in 2008, 60163 at Kidderminster in 2009, 43106 and 7802 chassis at Bridgnorth in 2011 and finally 86701 at Northampton in 2012. This entry was posted in "On This Day" (in the past), All recent postings, Sharpo's World gallery, Sharpo's World Photo Updates on October 24, 2018 by Sharpo. The forecast was for rain, most of the day – but supposedly heavier in the afternoon. As I had not yet seen 63395 I thought I should make the effort to see it. It was booked to leave Kidderminster at 10.45 so no rush to get over there after walking KC. The rain was falling all the time I was filming, from under an umbrella, and I was glad to be on the train back home. This entry was posted in All recent postings, Sharpo's World gallery, Sharpo's World Photo Updates, Sharpo's World video updates on September 20, 2018 by Sharpo.